Whilst ergonomic office chairs help with your posture and improve wellbeing at work there must also be some consideration to soft seating and break out areas as this is where we should feel most at ease. This type of seating may be designed to suit the individual or group more by offering a little more than a standard tub chair or sofas. Soft seating, designed with well-being in mind may be a soft, beanbag style seat, for those wanting fully relax or maybe to take a short nap in order to feel rested and recharged. Seating within this category may also offer refuge and privacy for those wanting to take time out for themselves or for less formal meetings or get-togethers with a colleague. We even can offer soft seating with air systems which help you maintain a healthy breathing pattern away from toxins or stuffy air. Ballo is a multipurpose stool for short-term, active sitting. Ideal for a variety of uses, settings and spaces, the Ballo stool is suited to home and office environments and everywhere in between. Perfect for pulling up a quick seat, surrounding a conference table or for use in a reception area, Ballo inspires activity. Available in seven colors, Ballo's playful aesthetic complements any space while promoting healthy movement. Ideal for reception areas, touchdown spaces and collaboration spaces. BuzziBalance creates a non-traditional environment that brings people together, provoking joy and conversation. 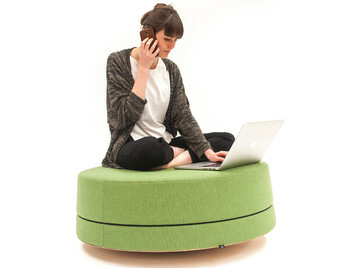 A rocking pouf in small and large versions, the benefits of purposeful stretching are brought into the workplace. The BuzziBalance family offers both a seating and standing element. 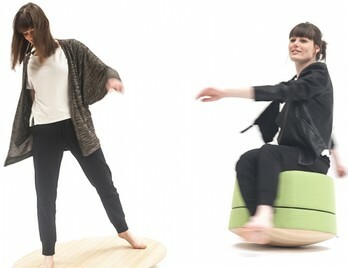 Although not a breakout seat, it does compliment the BuzziBalance stool, as both feature the wooden-carved rocking board. Products from the BuzziBalance family create a non-traditional environment that brings people together, provoking joy and conversation. While standing on the board your muscles are activated, and as one balances for a few moments, the mind and body are awakened. 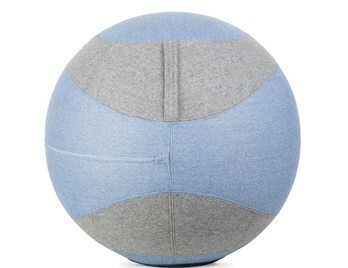 Office Ballz are a fun alternative seating solution which can be used for short meetings or breaks. They will keep you upright which will help to strengthen muscle groups in your back and legs. 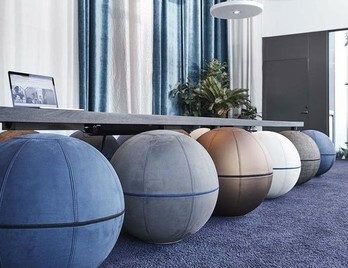 They are available in a host of commercial grade fabrics or vinyl and they have a metal base which prevents the ball's surface from picking up dust and dirt from the floor. We would not recommend using this seating solution as an alternative to a standard office chair. Mobility and simplicity of form are the characteristic features of Dotto Ball and the Dotto Cubes. 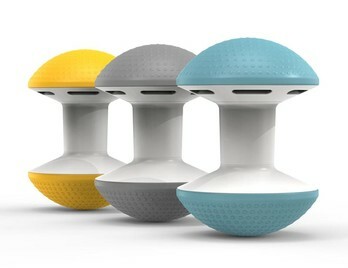 The Dotto ball forces the user to balance their body and stay in constant motion, which is very beneficial for those employees who spend most of their working day sitting at a desk. Available in two sizes with contrasting fabric options in commercial grade fabric. A unique sofa system that enhances your well being, productivity and health. PAZ stands for Pure Air Zone. PAZ combines the functions of sound absorption and air purification in a patented design. The inbuilt air filtering system creates bubbles of clean air through the back of the sofa. The filter system, however, is draught free, silent and energy-efficient. This chair has many possibilities for you to explore. 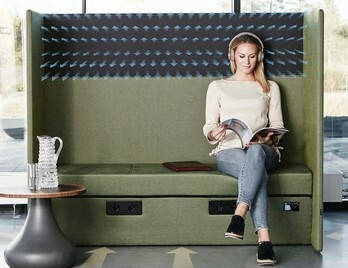 Bond seat is a modular system of high backed seats which can be connected to form a long row that forms a sofa whilst shielding and protecting the user from any sounds and noises which they may be subjected to. These seats give you the opportunity to make and configure setups and layouts making your breakout area unique and flexible. The Hut's or house simple straight lines are inspired by the classic game of Monopoly which gives a timeless shape to the practice room in a room concept. The Hut is versatile and can be used for several purposes; for an individual workstation, a small sit-and-stand meeting room or as relaxed break out areas. The Hut's versatility means it can provide part privacy and visual shelter which allows for workers to feel more relaxed and at ease whilst in the Hut, improving focus and wellbeing. Soft seating or breakout seating is a fun way of interjecting creativity into your office environment. It can often be a process in which the staff becomes involved in as they will all be using the area, so it could be a good idea to let them help make the decisions or at least involve them in the early design and planning stages. Providing a relaxing, fresh and creative breakout space allows employees to feel valued, as they can spend time away from their work, in their own alternative environment. 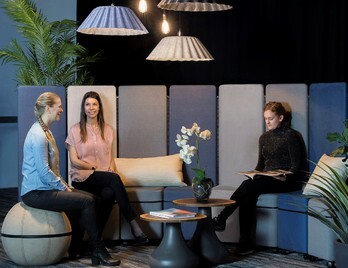 There are so many benefits and advantages of designing and implementing a comfortable break out area at work, helping employee wellbeing in a number of ways. Making your office more sociable helps with employees wellness and wellbeing, as providing respite opens up opportunities for employee relationships and bonding. Social break out areas which have been carefully thought out and considered will help boost employees productivity and wellbeing, as when people feel relaxed, they become more talkative and open up. Games are also a fun way to improve the social aspect of the office such as pool, table football or ping pong? What better way to let off some steam and have some fun with a colleague, you may even discover a hidden talent? On the flip side, it may be better for these sort of games to be played away from those who are working as the noise generated could prove to be distracting and increase stress levels. It's likely a creative idea can come along at any time or be inspired by something nonwork-related. However, if you are looking to generate or foster these ideas in-house, new starters will expect, or maybe even demand (?) a dedicated zone to think or work this way. Having a comfortable environment or break out area in place will help retain talent and make a workforce happier, improving wellbeing. It's easy to see why having a relaxing breakout area is correlated to improved performance and increase productivity. Numerous studies have shown that letting employees switch off for a bit can actually make them work harder. It's common sense really, if you are able to rest and recharge properly you can come back to each task with zest and vigour making each task more manageable and improving your working day. Not all meetings have to take place in the meeting room. You may have regular visitors that don't necessarily need to be given the boardroom treatment each time they visit. Or you may want to hold a meeting away from the formalities of the boardroom? Meeting your clients or visitor in break out space shows that your business is flexible and more importantly helps your clients feel more relaxed. It seems wherever you look these days there are stories and people who are a little stressed out, why is this? Well there are whole host of reasons and one American Study simple put it down to 'because we are more stressed', not very insightful but you cannot argue with the findings. So finding the right work-life balance is still high on peoples agendas but we need to make allowances for them to manage their personal lives. Paying bills, arranging MOT's, talking to a partner, family members friends who may need your help. All of these impact your work life and can in some ways be impacting your work. However, if you are able to take these calls or manage your private affairs, well in a little more privacy, then you will in no doubt feel more 'in charge' and relaxed, which in turn, will improve your performance and wellbeing at work. If you are thinking of planning a breakout area or would like to discuss various options then please do not hesitate to contact us on 01823 663880. We would look forward to hearing from you.